Q: How does QuoteWerks share quotes between offices? A: In today's business environment there is a great need for software applications that are flexible and mobile. QuoteWerks can be installed at the main location's network and also at remote offices and on remote laptops. With QuoteWerks installed at these various locations, there is a need for synchronization. 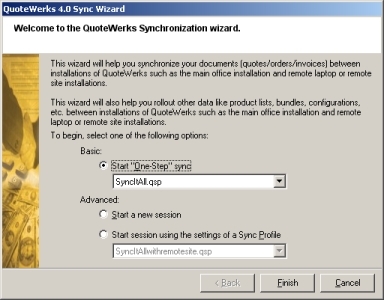 The Professional and Corporate Editions of QuoteWerks have a Sync Wizard that synchronizes documents simultaneously between offices as well as with laptop users when connected via a WAN or direct network connection with the main installation of QuoteWerks. 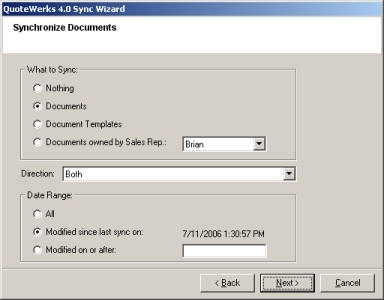 The Sync Wizard allows you to select the direction of the sync and which documents to be synced by a date range, last sync, as well as by a particular sales rep.
You can also synchronize QuoteWerks folders, their subfolders, and the files within. The files on the remote can either be replaced or only updated with new or updated files. With all Editions of QuoteWerks, the document transport features enable the users to exchange documents (quotes/orders/invoices) between multiple locations such as laptops, and other office locations. After you create a document transport file, you can send it to another QuoteWerks location via e-mail, WAN, LAN, Disk. Also, your CRM software like GoldMine, ACT! , ACT! for Web, Autotask, ConnectWise, Outlook, Outlook BCM, MS CRM, SalesLogix, salesforce.com, or SugarCRM has synchronization features that synchronize these document transport files. This other location could be your office if you are using a laptop computer, or another office location if your company has multiple offices. Once the file reaches the other location, it can be imported into that locations database using the "Import document transport file" facility. If using your CRM software's synchronization features, these quote exchange files are automatically imported into your locations database when you open the linked document transport file. Q: Can QuoteWerks synchronize product and pricing information? The Corporate Edition of QuoteWerks using SQL as the backend makes it easy to sync product databases from the master installation or remote site to a laptop. You can also rollout Products Databases, Bundles, Configurations, User Rights, and more to remote users. 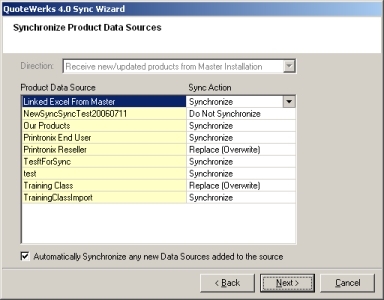 The Sync Wizard process of "rollout" replaces the data on the remote installation with the data from the master installation, thereby erasing any change the sales rep may have made to the product database while he/she was away from the office. This works well in the scenario where the main office is where the product database is maintained, and then distributed outward. With the Standard and Professional Editions, typically the solution to synchronize the product databases is to maintain the product database at the main office location, and then just copy the database out to the notebooks whenever the notebooks need to have updated pricing. This works well in the scenario where the main office is where the product database is maintained, and then distributed outward. 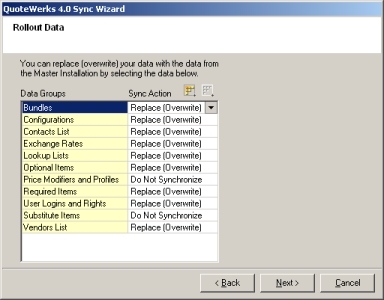 The only drawback to this solution is that when you copy the product database from the main copy to the notebook, you replace the version of the product database that is on the notebook, thereby erasing any change the sales rep may have made to the product database while he/she was away from the office. Each product database is only a single file, so it is relatively easy to copy that file to the notebook.